Aspire Breeze and Breeze 2 Clearomizer heads Available in: 0.6ohm 1.0ohm (For Salts liqui.. Aspire Nautilus and Nautilus 2 BVC Clearomizer head Available in: 0.7ohm 1.8ohm ​Pri.. 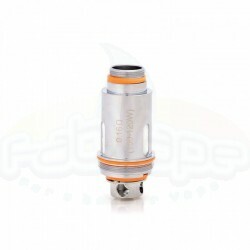 Aspire Nautilus 2s BVC Clearomizer head Available in: 0.4ohm ​Price per pcs .. Aspire Nautilus AIO Nic Salt Clearomizer head Available in 1.8ohm Price per pcs .. Aspire Nautilus AIO Pod 4.5ml Include AIO NicSalt coil 1.8ohm Price per pcs .. Aspire Nautilus Χ Clearomizer head Available in: 1.5ohm ​Price per pcs .. 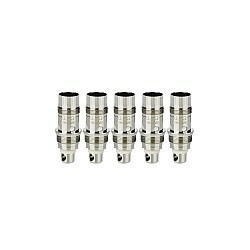 Aspire Cleito 120 Replacement head Available at 0.16ohm for use with 100W to 120W Price per pc.. 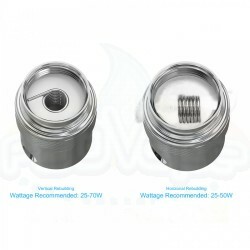 Aspire Cleito 120 RTA Head Make your own wires with this RTA head You can make 1 or 2 coils se.. Aspire Spryte Nic Salt Clearomizer head BVC Available in 1.2ohm Price per pcs .. Aspire Spryte Pod 2.0ml Include BVC coil 1.8ohm Price per pcs ..
Eleaf GS Air Clearomizer head Ni200 Available in: 0.15ohm ​Price per pcs ..
Eleaf Melo Atomizer Head Available in: 0.3ohm 0.5ohm ​Price per pcs ..
Innokin - Z-plex 3D Mesh Coil Available in 0.48ohm Compatible with: Innokin Zlide Inn..
Innokin - Zenith Clearomizer Head Available in: 0.8ohm 1.6ohm Plexus MTL 0.5ohm ​P..
Innokin EQ Cartdridge 2.5ml Resistance : Plexus EQ 0.50oHm Price per pcs ..
BF Cubis Atomizer head Available in: BF SS316 - 0.5ohm BF SS316 - 1.0ohm BF Clapton -..
BF Cubis RBA Head ​Price per pcs ..
Joyetech Exceed Atomizer Head Available in bellow types: 0.5ohm - DL (20-35 Watt) 1.2ohm ..
Justfog Minifit Cartdridge 1.5ml Price per pcs ..
Kanger Subtank OCC Ni200 Coil head - Organic Japanese Cotton Wick - 0.15 Ohm Coils - Only Suita..